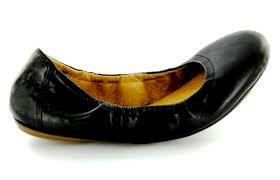 If you are female you more then likely own a pair of unstructured ballet flats. And there is this idea that by wearing ‘flats’ to work instead of high heel stilettos we are doing the right thing. But in fact, we may be causing just as much damage to our feet. These innocent-looking shoes may be doing damage to your feet. These innocent looking shoes can cause bunions, tailors bunions, corns, callous, heel pain, knee pain and forefoot pain. In a ballet flat, there is no fastening, i.e. laces or a strap across the top of the shoe, so our toes grip onto the shoe to keep it on. This can cause callous build up and corns. It can also worsen bunions as the edge of the shoe may rub where the bunion is situated, causing it to enlarge. Another important factor weighing against soft ballet flats is the lack of heel counter. This means that the back of the shoe is ‘floppy’ where it should be nice and firm to hold the foot in place and stopping it rolling in or out. And the most obvious problem is there is no cushioning on the sole of the shoe. Your feet can be in these shoes for long periods of time on hard floors. This can cause inflammation at the heel site. One or a combination of these issues may result in heel pain, knee pain, or various degrees of forefoot issues. Replacing your ballet flats with a more ideal flat shoe is a priority. Look for a shoe with a strong rear counter, fastening across the foot and a little bit of height at the heel with cushioning throughout. And be careful of the edge or seams on your forefoot to ensure minimal or no rubbing. A shoe with all of these can make your feet much healthier and happier!